One was recorded by Sudara (and gang?) 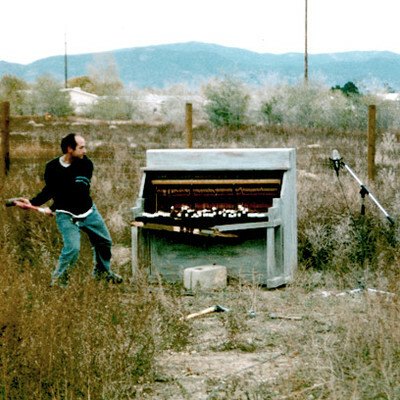 axing away at a hapless old piano in New Mexico. today, I convinced Sudara to noodle on the piano and send it over to me. I received 15 minutes of gorgeous playing! So that’s what you are hearing. yep. Woohoo for 3:30 morning uploads. Uploaded August 27, 2009 8:22am . Thanks, man. Let’s do it when you can. Where are you heading? @ The Good Lord Sluk thanks! I’m happy to hear that you like it so much! Were you there for the event? Very effective use of the reverb…very interesting work overall. no pianos were harmed during the production of this music. awesome Glu. Now including incriminating pictorial evidence in track description! Who knew that destroying a piano could be so beautiful. This is awesome. Just awesome. Who knew that destroying a musical instrument could be so satisfying? Oh man I love what you’ve done with this, absolutely love it!